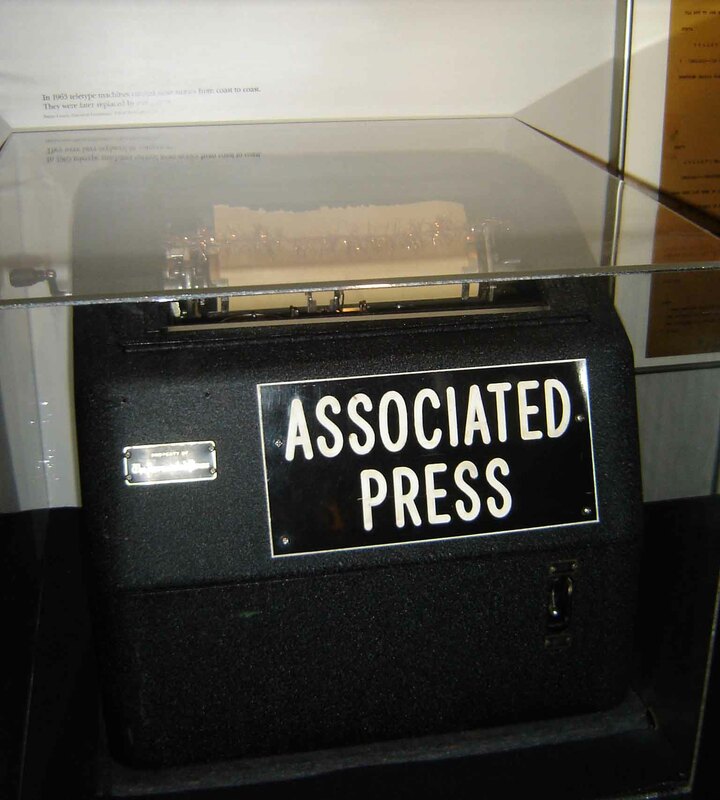 The Associated Press teletype that was used to disseminate information about JFK's assassination. I’ve heard people say that newspapers are the rough draft of history. On Saturday, I gained a better understanding of what this means. While at the Sixth Floor Museum in downtown Dallas where John F. Kennedy was shot, I gravitated toward a display titled: “Pandemonium and the Press.” The display shows photos of journalists at the scene of JFK”s death and features vignettes about the role of the press during this traumatic moment in history. Many of the photos and documents in the museum would not be there if it hadn’t been for journalists. There were no bystanders sending mass text messages or bloggers detailing the events of Kennedy’s 1963 assassination. Reporters had to act fast with little technological help. And act fast they did. They provided vivid photos of the presidential limo speeding down Elm Street after JFK was shot, and wrote stories for the next day’s paper about his death and the emotional reaction it stirred. “The press and the television people just took over,” Forrest V. Sorrels of the Secret Service said at the time. I saw more proof of journalists’ hard work when I walked into the museum gift shop. I couldn’t help but buy a reprinted copy of the paper The Dallas Morning News put out the day after Kennedy’s death. For me, it’s a reminder of what journalism is all about: reporting truth and recording history in the making. I’m tempted to hang the reprinted paper in my room, in part because I’m a journalism nerd, but also because I think that now more than ever, it’s important to remember that journalism is a noble profession that still very much matters.